The packaging for the "Nacre" arrived on the 31th of January 2016! Our printer has done an outstanding job of capturing the quality of our brand. 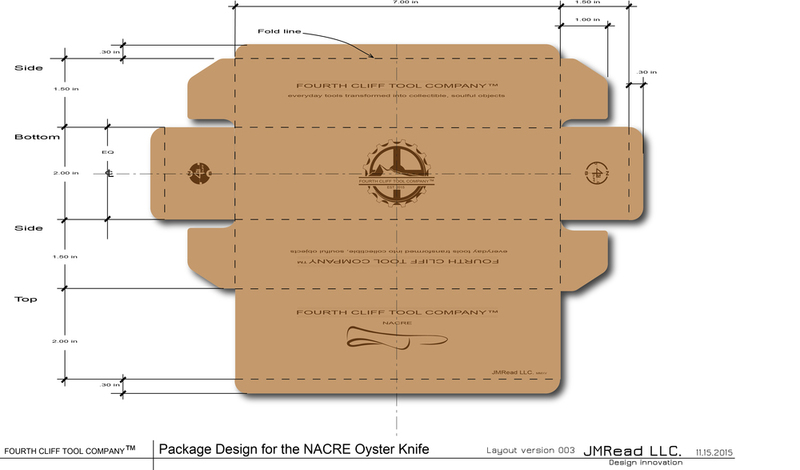 Our new packaging design and graphics for our first product the nacre oyster knife. We are looking to have our packaging handcrafted letterpress printed on heavy brown kraft paper, with a New Enland base printing press company. We are still thinking that we will have the knife floating on a bed of blue shredded paper curls. We are very excited with the progress of The "Nacre" Kickstarter Campaign. With only three days left in our Campaign, we are thrilled to share that our Nacre Oyster Knife has become over 200% funded! Our big news today is the article in South Shore Living Magazine! Please share this news with anyone who might be interested in the mission of our company, Fourth Cliff Tool Company.